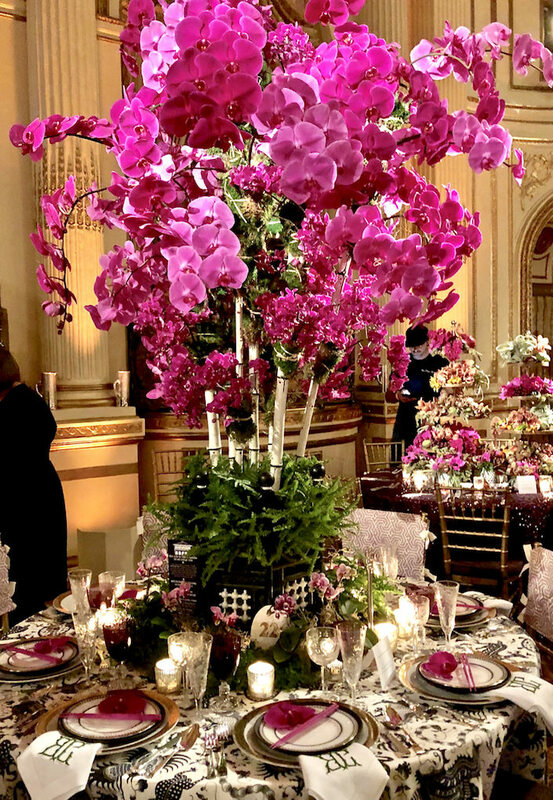 Inspired by Singapore’s black and white Edwardian houses, Brockschmidt & Coleman set a bamboo fantasy with a tablecloth in a graphic Quadrille pattern accented by an explosion of fuchsia orchids in a stunning centerpiece by Elizabeth Spencer Designs. 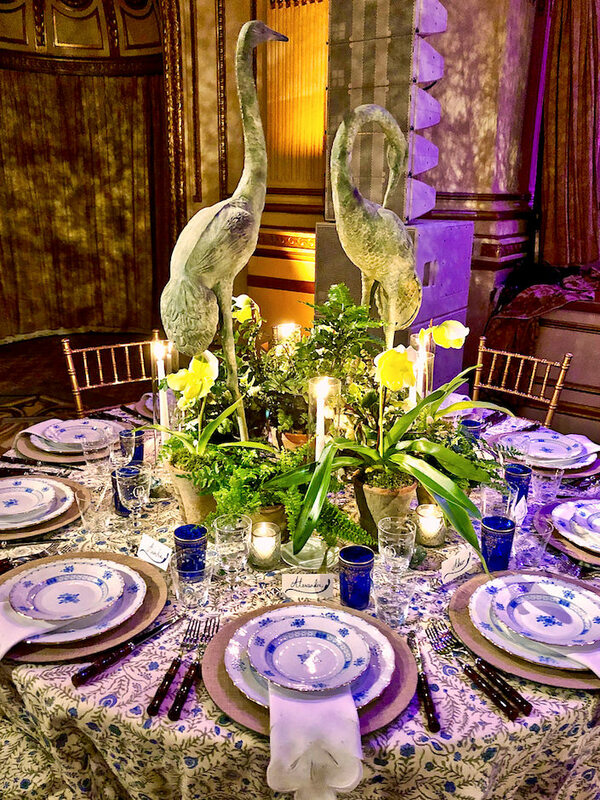 China, flatware and silver from Replacements and napkins from Leontine Linens completed the chic vision. 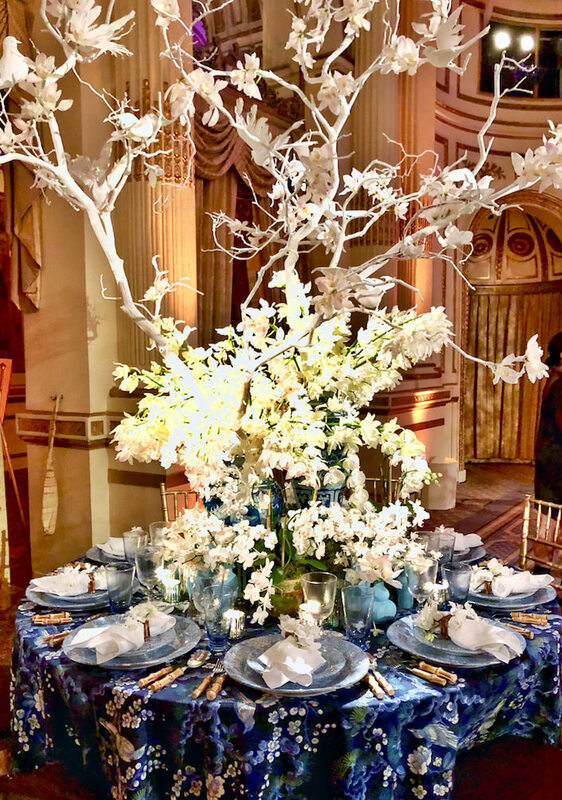 Cece Barfield based her table on a blue and green scheme anchored by a tablecloth of Bennison Cinnabar. 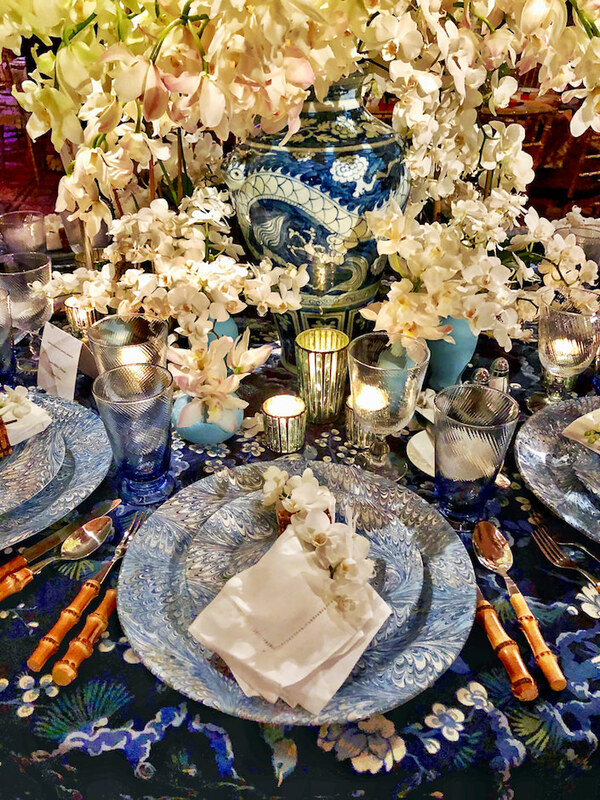 Herend’s pretty Blue Garden and florals from Plaza Flowers completed the picture. 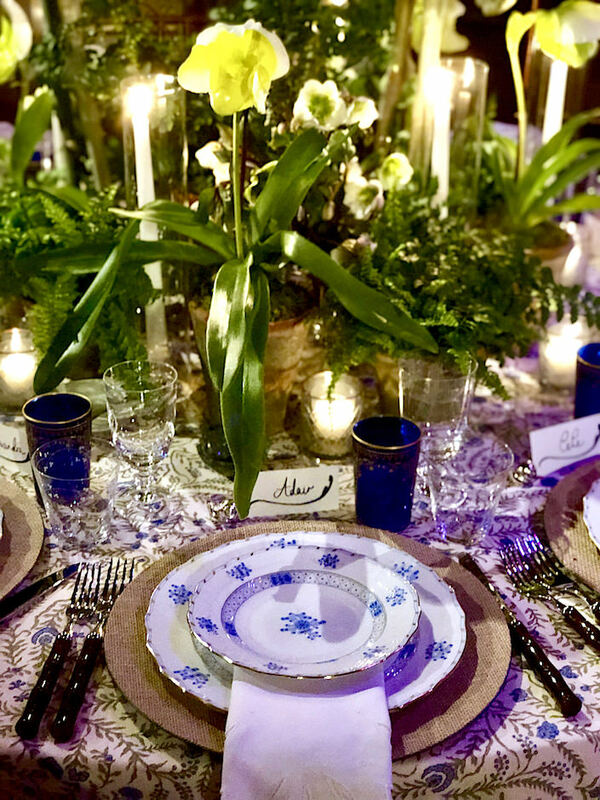 Penny Morrison plates, her own glasses and bamboo flatware, Julian Mejia napkins and centerpiece florals by Plaza Flowers. and collaborated with Kneen and Co to create a dramatic custom Marie Daage porcelain pattern. 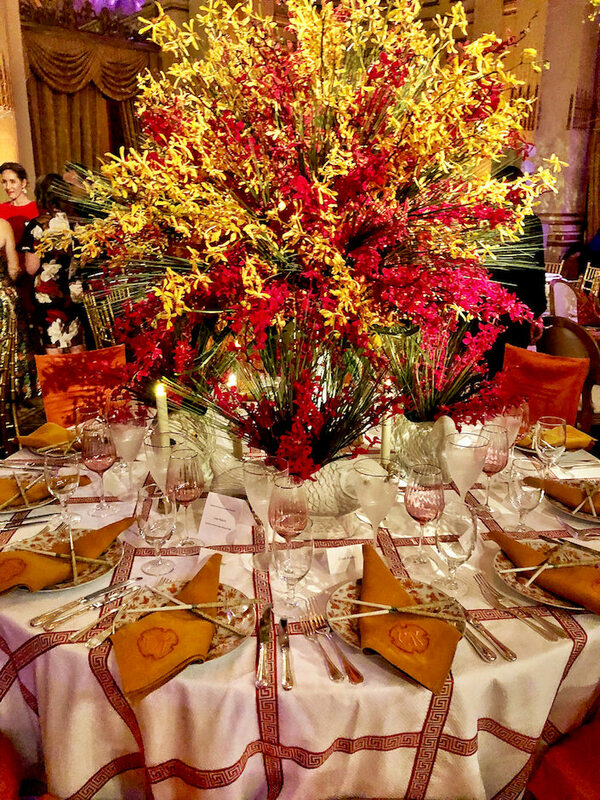 Flowers by Lady Fleur. 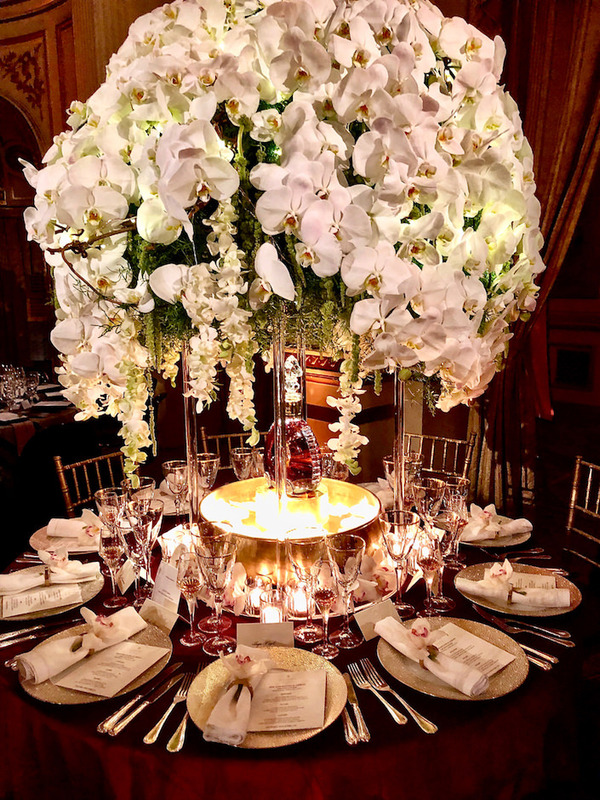 Architecture and interiors firm Craig & Company went to the dark side with their lush and luxe table. 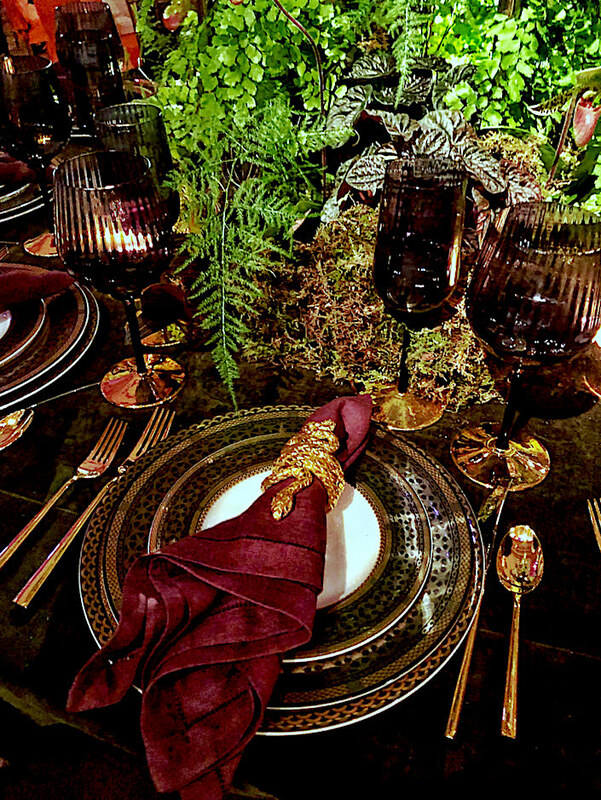 Caskata’s Hawthorne Onyx, with its jewelry-like gold and platinum mix set the tone. 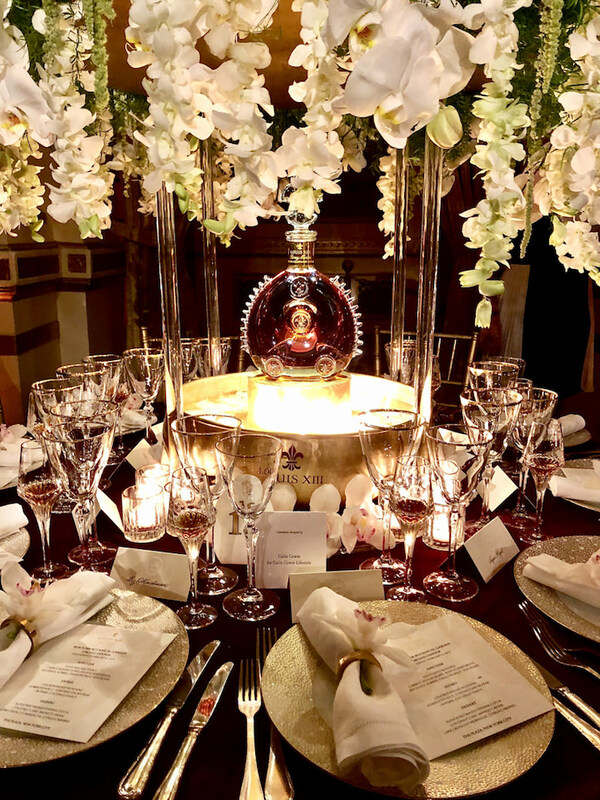 Glamorous Nason Moretti stemware, House of Hackney napkin rings, SFERRA napkins (courtesy of Chicago Luxury Beds) and a lush botanical centerpiece by Jayson DeGeeter completed the scene. 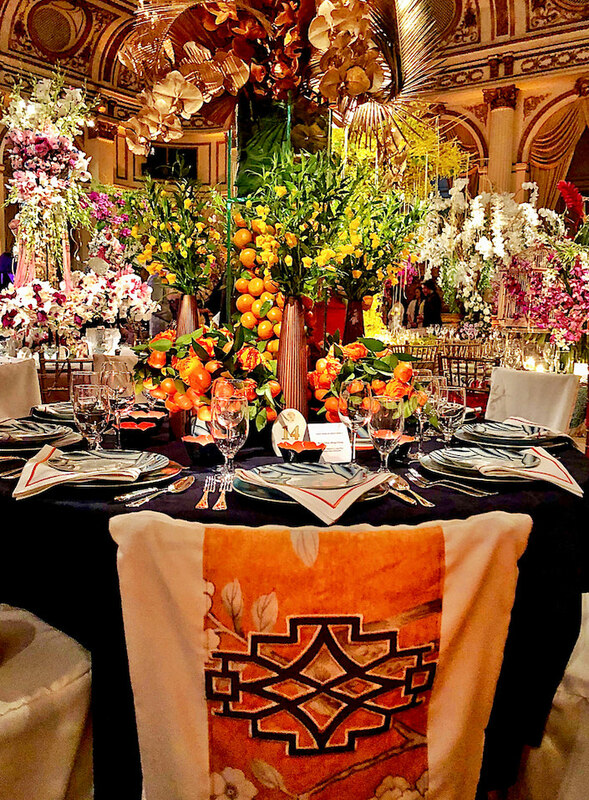 Paris Forino‘s ebullient table started with Jim Thompson’s vibrant embroidered Heliconia Dreamin‘. 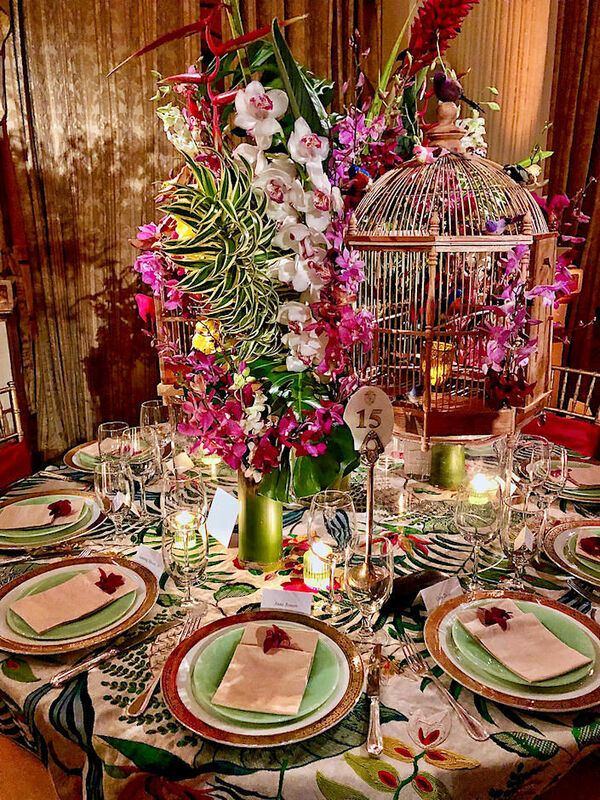 And while I don’t have any more details, I loved the tropical and exotic feel! 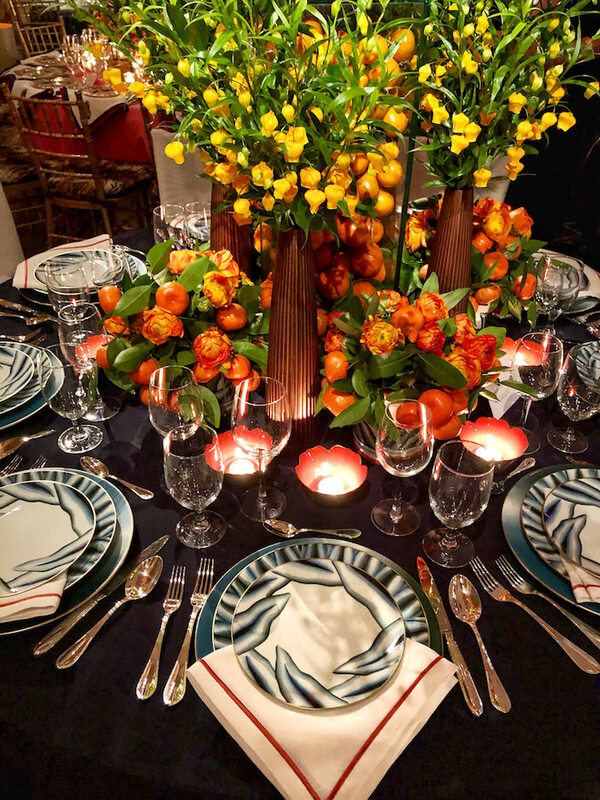 Cathy Kincaid created a clever tablecloth with a grid of Samuel & Sons trim, anchored by a fabulous centerpiece by Sebastian Li in a John Rosselli ceramic fish container. 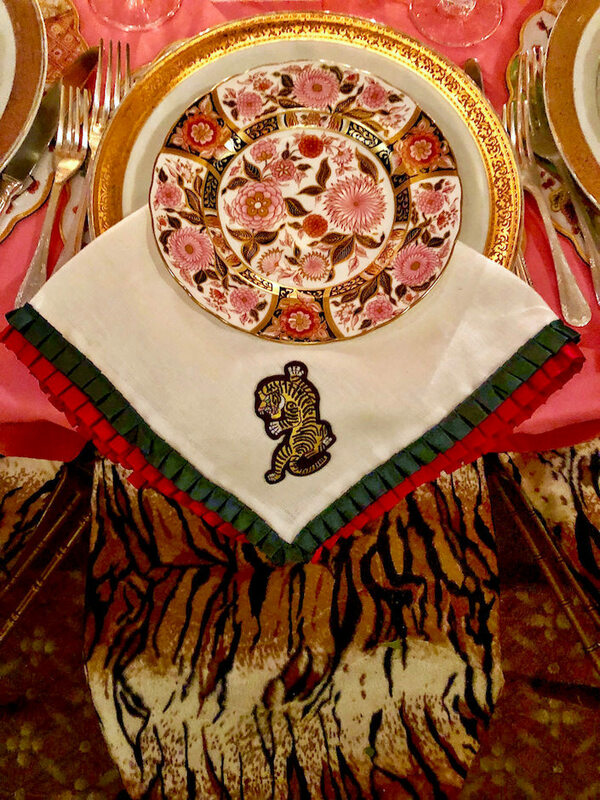 And one of my favorite Mottahedeh patterns, Sacred Bird, sits under embroidered napkins by Leontine Linens. 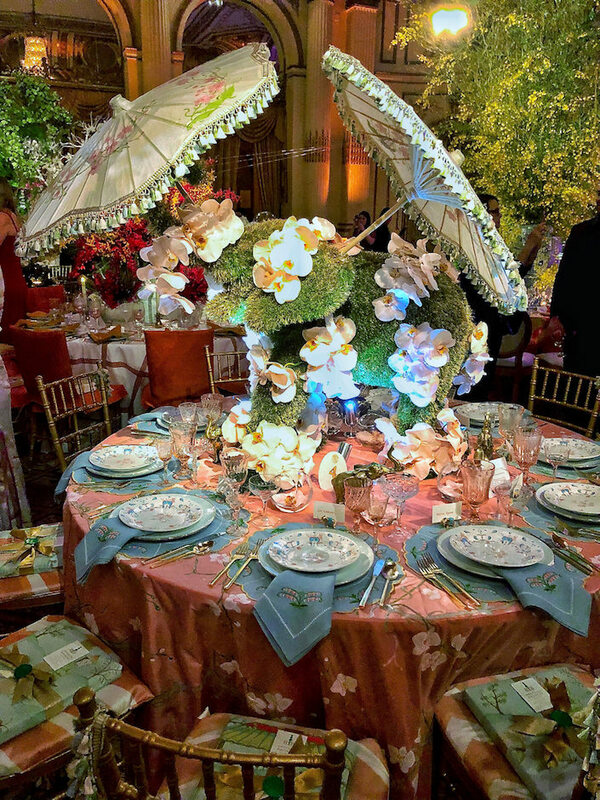 Brittany Bromley‘s table featured an orchid covered elephant under parasols trimmed in Timothy Corrigan’s new Chevallerie passementerie collection. 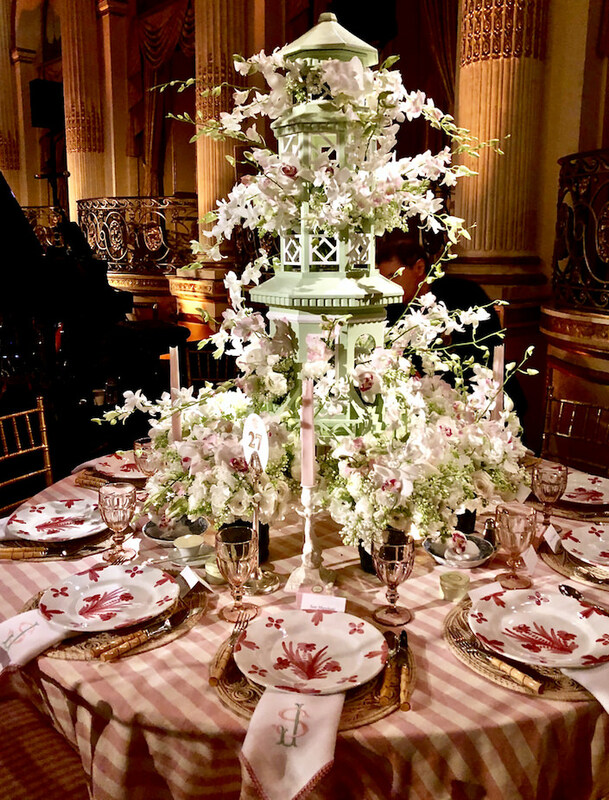 On a tablecloth of Schumacher silk taffeta hand painted orchids were festooned under place settings by Julia B. The lighting was especially challenging and I wish I had gotten a better shot of Phillip Thomas‘ beautiful table. 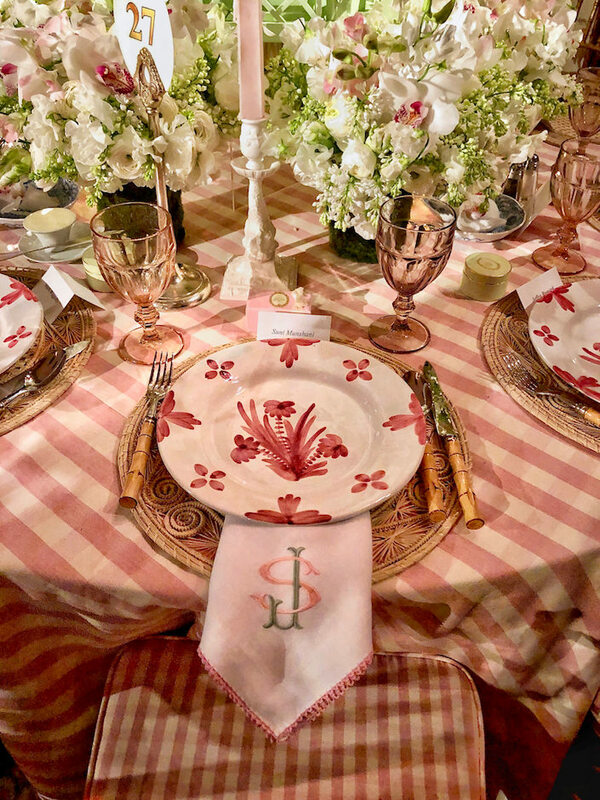 On a tablecloth of a brand new Manuel Canovas pattern, Phillip layered mats from Kim Seybert and R. Haviland & C. Parlon‘s Syracuse porcelain. 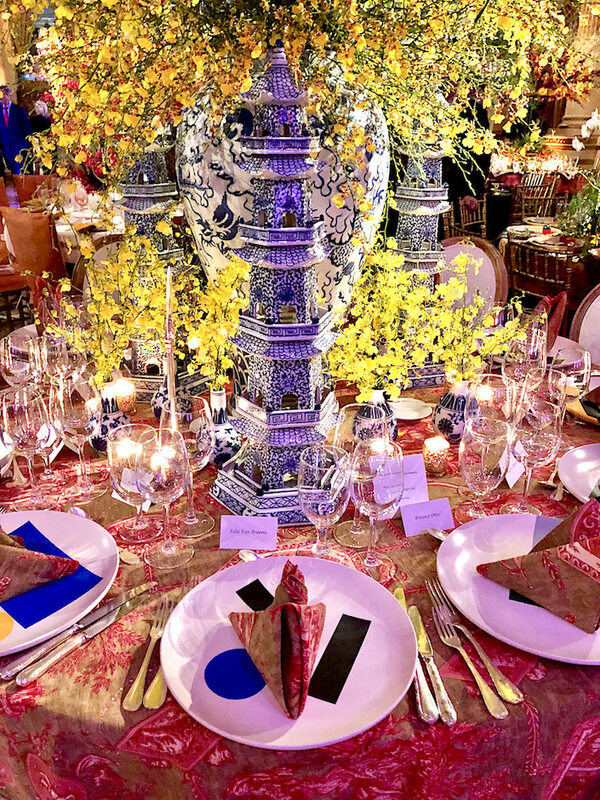 While I didn’t get a good shot of Robin Henry’s entire table, I loved the details of her Gucci inspired table that she commented referenced the over the top “tacky” family from Crazy Rich Asians. Another fun table I couldn’t capture properly was David Netto‘s. 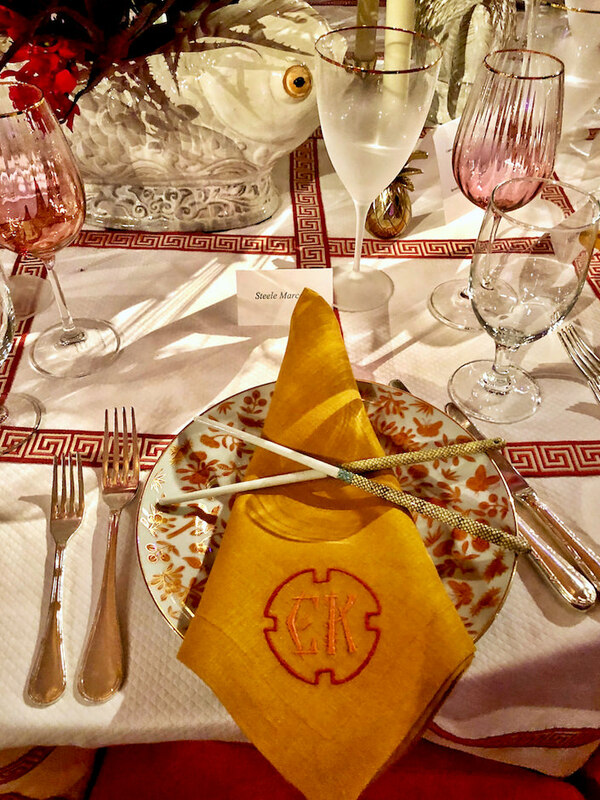 On a tablecloth (and napkins) made of a classic Pierre Frey toile, he layered Bauhuas contemporary plates by London based Darkroom with Pagodas from Frontgate. 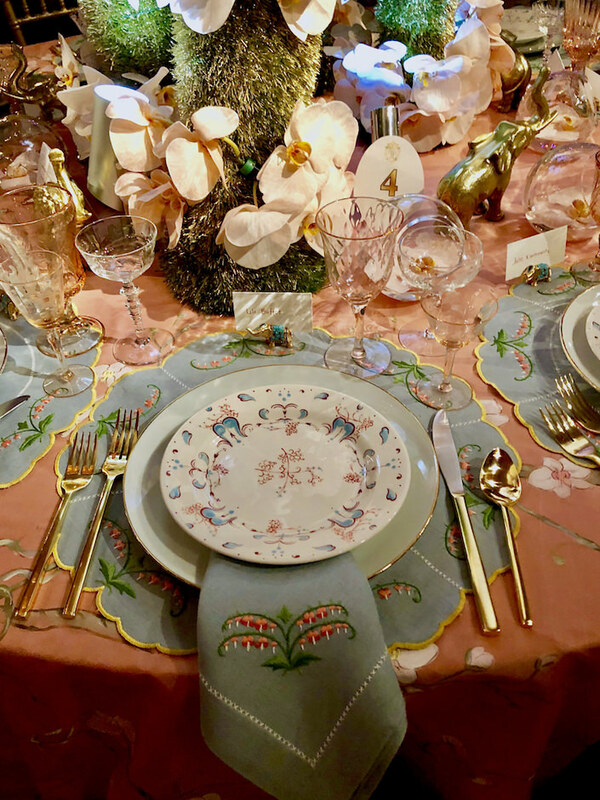 Their thoughtful table included, among other sources, Rogers and Goffigon linen, Augarten porcelain and Lalique crystal. with their own tabletop products. starring the signature crystal bottle center stage. Apologies to the other lovely tables that I either didn’t have time or good enough light to shoot. 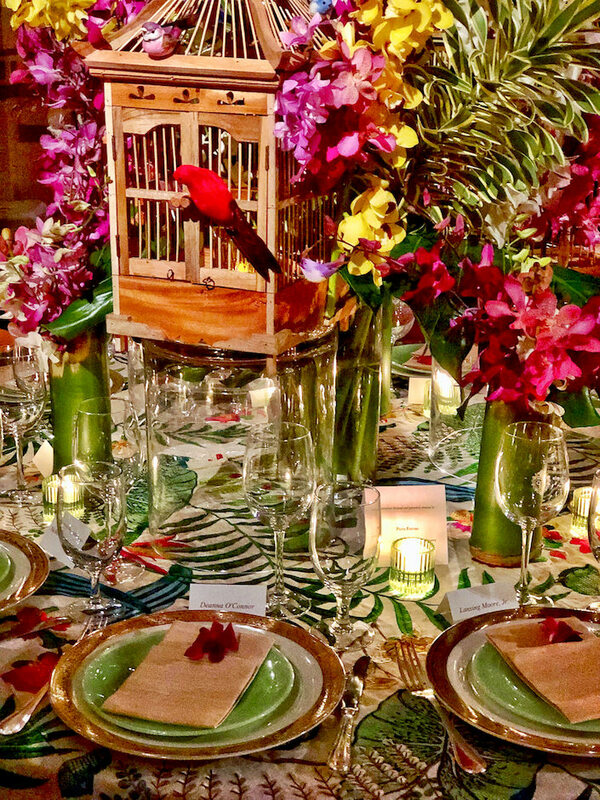 As always, it was an inspiring evening of great design for a wonderful cause, this year raising over $500,000 to benefit the Garden’s orchid research collection. This entry posted in garden, interior design. 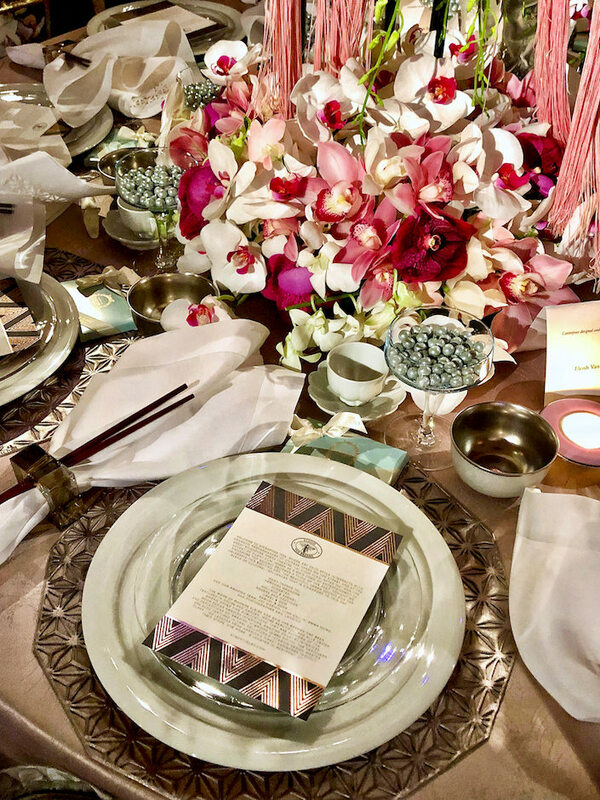 Entry Tags: New York Botanical Garden, New York Botanical Garden Orchid Dinner, Orchids, Tabletop Bookmark the permalink. 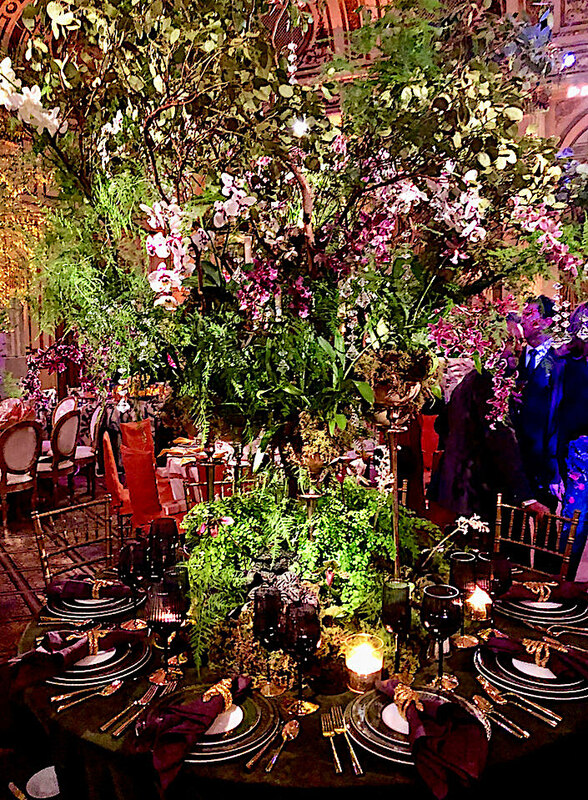 So, so, so infused with elegant beauty and lushness! I keep wondering which table you preferred? They certainly were splendid. Thank you for the beautiful posts and description. It was great fun learning about the black and white houses of Singapore and love learning more about orchids every time. I love seeing and reading your orchid blog every year. What a wonderful event. You have captured it beautifully. Lush and elegant. I do need some BAMBO UTENSILS!!!!!! What an eyeful! 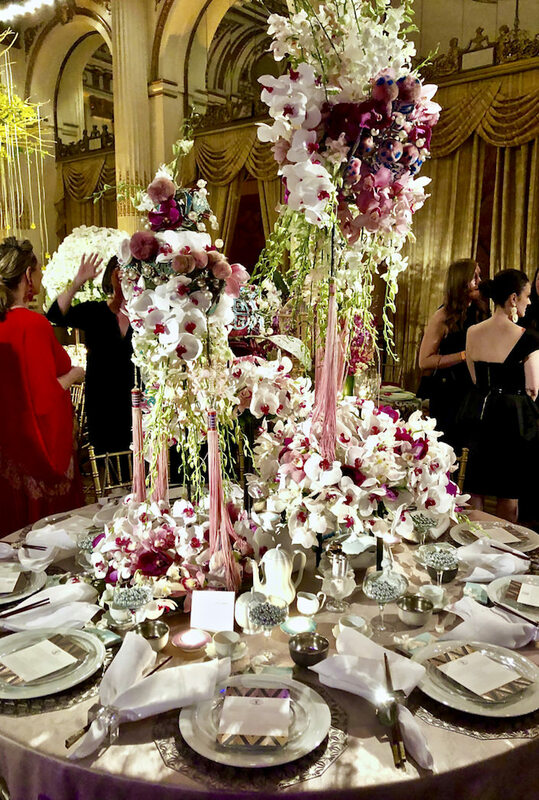 Between the flowers and the china and linens, one doesn’t know where to look first. It’s always fun to see what the designers do at this event. Stacey Thank You for Extraordinary Beautiful Photo !…Maybe the best show ever. 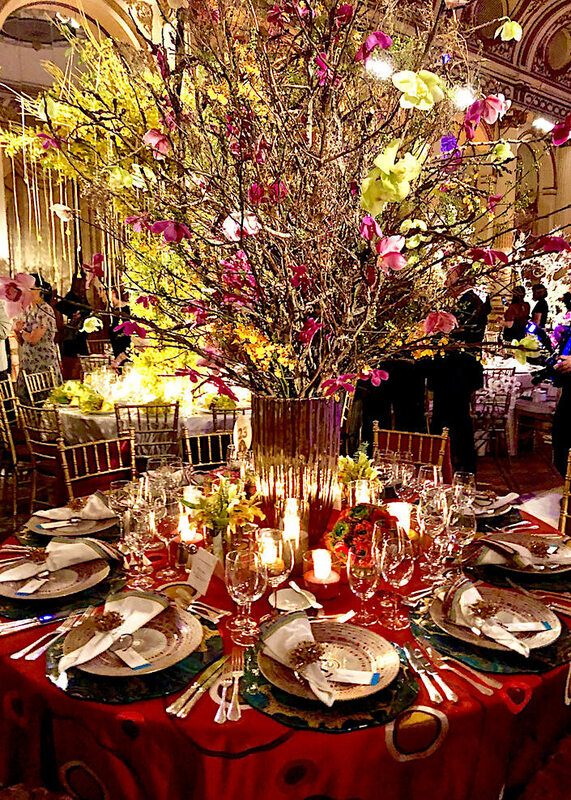 Each table exudes artistic talent, taste and drama. I would have loved to have been there. 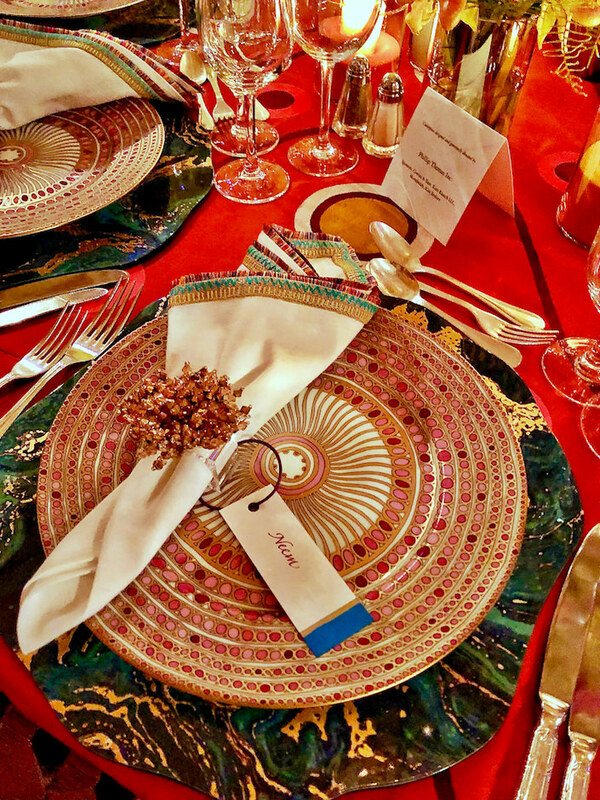 Great photographs, and I too need bamboo cutlery! 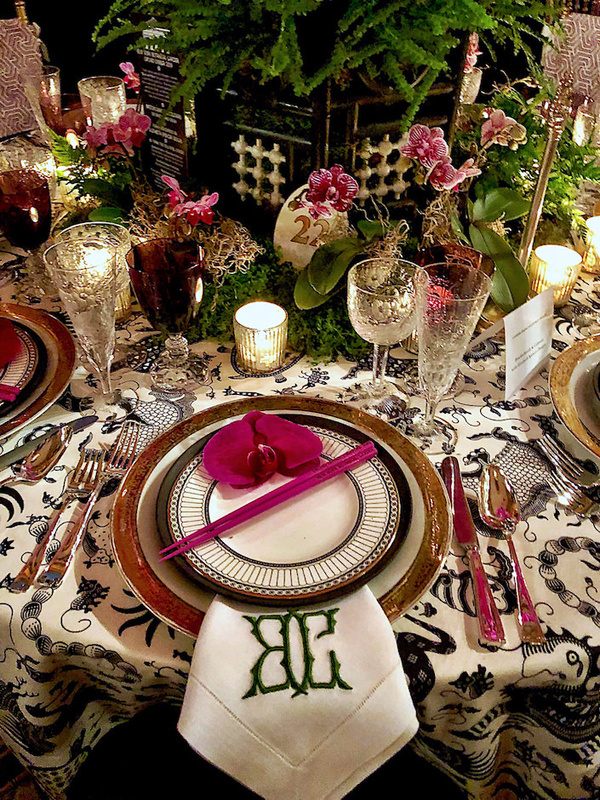 Gorgeous place settings – I’d be in such a wonderful mood eating at any one of those tables. 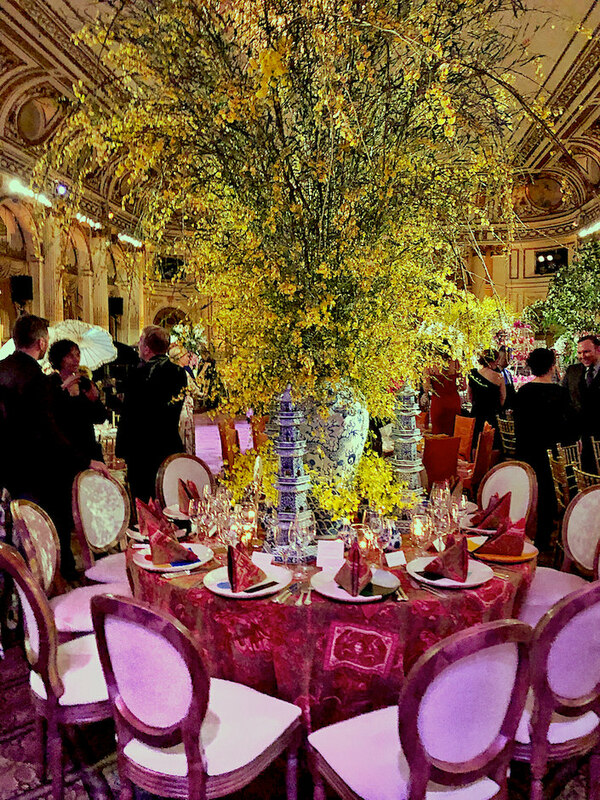 A dinning place like this, gives a total vintage feel. Extremely beautiful! This is one of my favorite posts of yours every year! Stunning! 82 queries in 0.823 seconds.